1. Hassle-Free Relaxation. 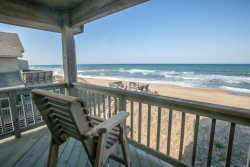 Bring the family together for a coastal holiday celebration everyone will love with a vacay in an Outer Banks vacation rental home. From large, well-equipped kitchens, perfect for preparing a savory feast, to dining rooms where conversations seem to linger, to miles of pristine empty beaches perfect for that post-dinner stroll, creating unforgettable Thanksgiving memories is easy in an Outer Banks vacation home. 2. Play Time. The temperature around Thanksgiving usual stays in the high 50’s (sometimes higher, sometimes lower – it’s all up to Mother Nature). The weather makes the perfect setting for a post-Thanksgiving dinner stroll on the beach. It’s also amazing for the abundant fishing opportunities this time of the year, as well as some these OBX events: Turkey Trot, Fun Runs, Kites with Lights (thrown by Kitty Hawk Kites), and Grand Illumination ceremonies around the island. 3. The Food. Duh… You can cook a delicious traditional Thanksgiving dinner in your rental home, or try some coastal-inspired side dishes, such as oyster stuffing, Hatteras-Style clam chowder, baked crab dip. The options are endless. Another option – don’t cook at all! You can have one our local restaurants (such as Ten O Six in Kill Devil Hills) cater your turkey day feast, or you can dine-in at one of the many restaurants that are open that day. 4. Retail Therapy. Christmas IS right around the corner after all. There are so many specialty shops on the Outer Banks that you’re bound to find a unique gift for your loved ones (or yourself). PLUS – it’s the best time of the year to score deals. Visit the Duck Waterfront shops, Kitty Hawk Kites, and one of the island’s surf shops, art gallerias, and consignment stores on the beach to score amazing one-of-a-kind treasures made by one of the many talented artists on the OBX.